Last week I was traveling for work, I had some awesome meetings and work related stuff happen. But I also had a great first real training week back since Quassy. I had to play around with the schedule a bit to make it work with my meetings and the crazy hot weather but I got everything except a swim on Friday done. I even got to enjoy a fun training session in DC at Revolve Fitness. I go to their spin classes when I am in town to use them as my hill training days. I went with a friend and we got dinner after win win! Saturday I knew I just needed a little time to relax and recover from my week. So I took my time getting going and hung around the house w D. We even got some stuff done. By the time I was ready to tackle my 2:45 ride the weather was typical summer storm so I rode inside. But luckily I got to run outside for my brick. 3 hours of training- CHECK! 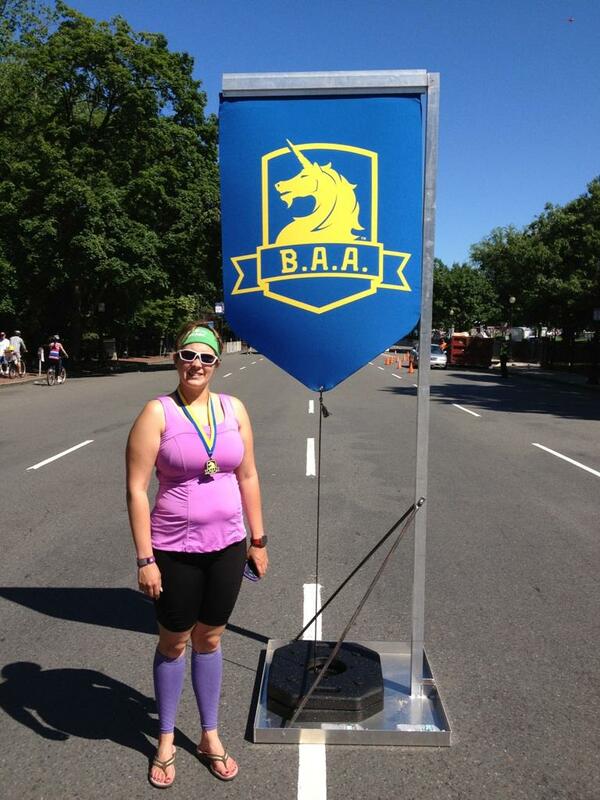 Sunday I had the BAA 10k. My brain was not in this race at all. At the start line I gave myself the permission to just run how I felt and whatever the result it was just a run and another one done in the Medley Distance. It was hot way warmer for 8am than I had planned. I am happy I stashed 1/2 a container of chomps in my bra before the run because I needed them at the 5k point. I hit my watch at the 5k and realized it was 30 something. Woah if I keep this up I can PR..... today?! I just focused on trying to keep the sub 10min mile pace I was doing. As I got close to the common where the finish was my watch was getting to 58. I was like crap I wanna get 59 something. I dug in. Screw it might as well try right?! As I ran down the finish chute D was screaming and tried to give me a high five but I just replied with "Close to a PR!" My watch said 1:00:08- BAA had me at 1:00:10. It wasn't the 59 something I had hoped- would've been nice to break 1hr. But when I looked it was still a PR by almost 40s. The awesome thing I am pretty psyched about is I negative split the 5ks- first one was 30:24 second 29:43.D had a great race- almost a PR- too especially since he was sick this week! After the race we headed over to Hopkinton state park to get in an OWS. I think the swim area there is about 200 yds so we got in about 1200yds in the 30min we were there. I think the swim really helped with my recovery I am feelin pretty good today. Another big training week ahead and it looks like a lot of rain and of course I have meetings all week! Oh well just another day in the Full Time Career trying to be a competitive triathlete life. Awesome! Congrats on the PR!